Introduction: End-stage renal failure management in children may require bilateral kidney removal prior to transplantation secondary to recurrent urinary tract infections, renin-dependent hypertension, vesico-ureteral reflux, proteinuria, risk of malignancy (Denys-Drash), or high output renal failure. Multiple incision laparoscopy and open surgical options have been employed to date. We present an alternative method for pretransplant bilateral nephrectomy in children via laparoendoscopic single-site surgery. Materials/Methods: Three patients underwent single-site bilateral nephrectomy via the SILS Covidien © system. Procedure time ranged from 330-370 minutes. Estimated blood loss ranged from 5-100 ml. Patient age ranged from 18 months to 18 years. There were no complications and all patients were discharged from the urology service within 4 days of surgery. Conclusion: All three cases were successfully completed via a single trans-umbilical incision and percutaneous needlescopic instrumentation. This approach is feasible in children even at relatively young ages and may provide a modest advantage over other approaches. 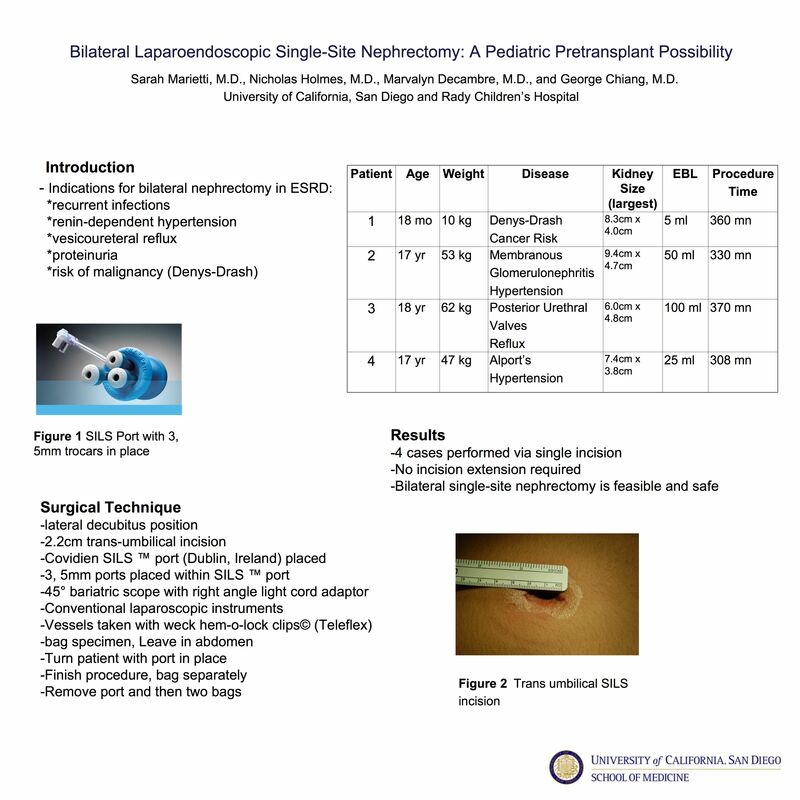 Discussion: Despite the increased technical challenges associated with laparoendoscopic single-site surgery, bilateral nephrectomies can be accomplished effectively in the pediatric pretransplant patient population with minimal morbidity. Single site surgery continues to evolve in children.